How healthy are you, really? Find out by completing a personal health assessment. Learn how to make healthier choices as you create your Wellness Plan. Learn how to manage your own personal health record. Then Live it! by evaluating and tracking your progress as you achieve your health goals. Eating healthy is an important part of living a healthy life. Eating healthy is a great way to stay energized all day, stay stong for sports and other activities, and to maintain a healthy weight. Knowing what to eat and what not to eat can be confusing. Let the Student Health Force® Eat Well experts help you make the right choices. New recipes and ideas are posted monthly, check back often. What good is knowing what to do, if you do not act on your knowledge? Student Health Force® schools and communities become healthier one informed choice at a time. Click on the link below to ask Dr. 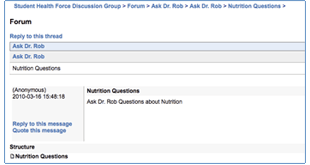 Rob a question about Student Health Force®, nutrition, exercise or health. This is public message board where you can post and view questions about healthy living.